Throughout the night, rescue services searched for survivors in the mountains of rubble. Nine people were killed, the youngest of whom was a 15-year-old girl, and 100 were injured. Eight nearby buildings were evacuated by authorities who were concerned that the collapse of the church might weaken their structures. 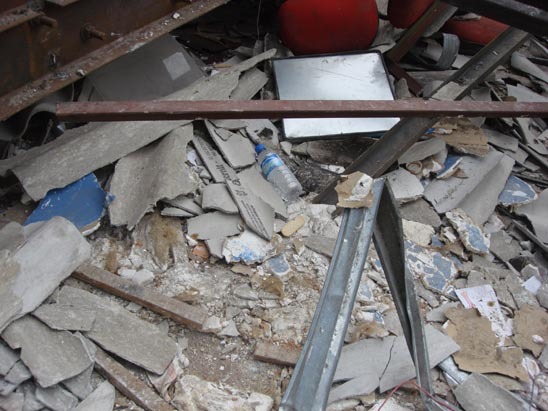 The roof had been replaced last November with around 1,600 corrugated asbestos-cement tiles produced by Eternit covering an area of 2,500 square meters; since the new use of asbestos had been banned in São Paulo State by law 12.684/07 some months previously, this act was itself a crime. 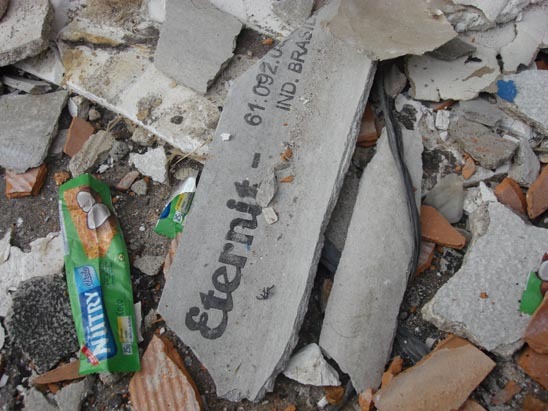 There is no doubt that these tiles were used; the Eternit trademark was visible on rubble which littered the devastated site. On January 22, the Regional Superintendent of Labor and Employment of São Paulo fined the Church and the company Etersul Hedges and Remodelling for using asbestos corrugated roofing tiles on the Church's headquarters in the Cambuci district.3 The Church and company were fined Reais 2 and 3 million respectively ($850,000, $1.28 m); unless the company provided the records of employees who installed the roofing material by Friday, January 25, further fines would be issued. The Church was given a maximum of ten days to submit a work plan for the safe removal of the contaminated tiles and debris from the site. Meanwhile, an order was issued by the Ministry of Labor that no one move the rubble or undertake any work or activity that does not comply with São Paulo codes of practice or laws. The Christian denomination Reborn in Christ, which was founded in 1986, has followers in Brazil, Argentina, Uruguay, Japan and the U.S. In Brazil, it is one of the biggest evangelical movements and numbers its members in the millions. The founders of this movement, Estevem and Sonia Hernandes, who also own a media empire, were arrested in 2007 by U.S. authorities on charges of smuggling $56,000 in cash into the country. They remain under house arrest in their mansion in Boca Raton, near West Palm Beach, Florida. The couple, who said they were saddened and shocked by the incident are wanted in Brazil on charges of money laundering, fraud and misrepresentation. 3 SP fine Renascer church and Etersul by misuse of asbestos. January 24, 2009.